Uploaded on 19-08-2018 by our crawler pet called "Spidey". 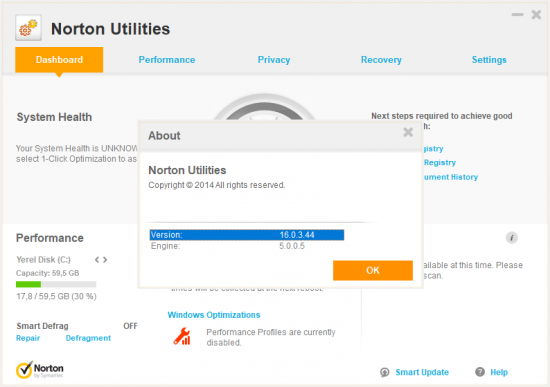 Norton Utilities - Cleans up, tunes up and speeds up your PC to help it run like new. Helps your old PC run like new. Speeds PC startup. Fixes common PC problems. Repairs hard drive problems and frees up hard drive space. - Finds and fixes issues in Microsoft® Windows® to prevent PC freezes, crashes and slow downs. - Scans for potential problems that can cause your hard drive to crash. - Helps you "rescue" accidentally deleted or damaged files that may still be retrievable on your hard drive. - Lets you turn off services and programs Windows automatically loads at startup, so your PC gets up and running faster. - Safely defragments, repairs and optimizes your Windows registry to help programs load faster and boost overall PC performance. - Frees up PC memory, so you can run more programs simultaneously, without slow downs or crashes. - Reorganizes (optimizes) files that are scattered across your hard drive, so your PC can find them faster. - Finds all the duplicate files, so you can remove them. - Removes the programs you don't use. - Permanently erases all record of your Web activities, so others can't see what you do online. - Lets you completely and permanently erase old, unwanted and unneeded personal Stuff, so no one can access or retrieve it. Finds all of the duplicate files scattered across your computer's hard drive, so you can remove them and free up disk space for more of your Stuff. Shows you step-by-step how to get your computer to run like new again. Removes the programs you don't use or which take up too many resources. Brings together (defragments) and reorganizes (optimizes) files and data that have become scattered across your hard drive. Scans your hard drive and alerts you to problems that can cause computer errors and crash your hard drive. Permanently erases all record of your computer and Web activities to protect your privacy. Helps eliminate Windows Registry problems that can slow down your PC, trigger error messages and cause Windows to crash. Removes gaps, free space and corrupt files in your registry and compacts it to free up system memory and make your PC start up faster. Makes a backup of the registry before making any repairs so you can easily undo them if necessary. Lets you choose what programs load automatically when Windows starts in order to free up memory and improve PC startup time. Improves startup time and reclaims system memory by letting you turn off unneeded system applications (also known as Windows services) that Windows automatically runs in the background. Lets you quickly restore accidentally deleted files that may still be retrievable on your hard drive. Alternative Torrents for 'Symantec Norton Utilities'.